Today morning Raksha Rajya Mantri Shri Subhash Bhamre inaugurated the online examination web portal of Indian Air Force at Air HQ (VB). Speaking on the occasion he congratulated the IAF for contributing towards the vision of 'Digital India' of the Prime Minister. 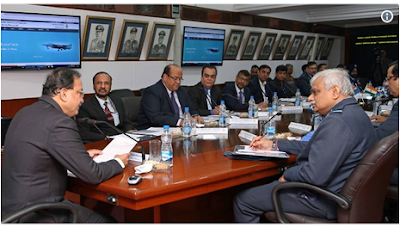 He also congratulated IAF for developing the online examination system in collaboration with Centre for Development of Advanced Computing (C-DAC) thus also following the 'Make in India' and 'Design in India' philosophy of the Govt of India. Air Marshal SB Deo PVSM AVSM VM VSM ADC Vice Chief of the Air Staff along with other senior Air Force Officers were present during the inauguration. IAF is the first amongst the three services to take up IT enabled Online Testing for induction in Officers and Airmen cadre. The proposal was approved in principle by Raksha Mantri on 24 Oct 16. In association with C-DAC, IAF is switching over to online testing wef January 2018 for which online registration will commence wef 15 Dec 17. Selection system for Officers and Airmen cadre in the IAF has been continuously evolving and sustained efforts are in place to strengthen the testing system. Though the existing system is time tested and well proven, constraints of testing capacity and geographical reach were major limitations in according opportunity to all the deserving and eligible candidates from across the country especially to rural youth. To improve upon the system and to make it more candidate friendly while enhancing organisational efficiency, a MoU was signed on 31 Oct 17 with C-DAC a Govt of India agency. The project will be implemented with effect from Jan 2018 for Air Force Common Admission Test (AFCAT) for Officer's cadre and Scheduled test for Airmen Recruitment (STAR) for Airmen cadre. Earlier IAF had hundred plus centres pan India for Officer cadre exam and fourteen centres for Airmen selection exams. Certain states / UTs did not have any testing centre. Consequently, candidates had to spend considerable time and resources on travelling to the testing centres. In the new system, there would be about 760 examination centre's all over the country and the maximum distance a candidate would be required to travel now will be considerably less from the place of his/her residence. It will enable approximately four lakh candidates for Airmen selection and two lakh candidates for Officer's selection, to appear in the exam every six months.